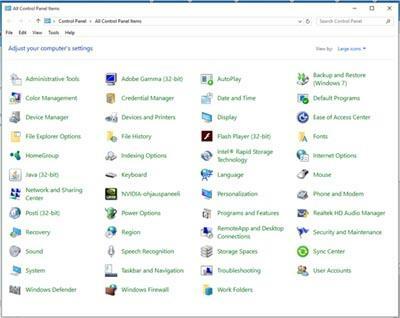 In Windows 10 many of the settings can be managed and changed using the new "Settings" window which you can find when you click the little Windows logo in the bottom-left corner of your screen and then click "Settings". Many of us who's used previous versions of Windows probably finds the old-style Control Panel more familiar and would prefer to use it. You can easily find it by clicking the small search icon (magnifying glass) in the bottom-left corner of your screen and then typing: "Control Panel". If you tweak your setting often, it might be a good idea to add a Control Panel icon right to your desktop. In Windows 10 you can do this by first going to the Settings. Click the Windows icon in the bottom-left corner and then click "Settings". Now click "Personalization". 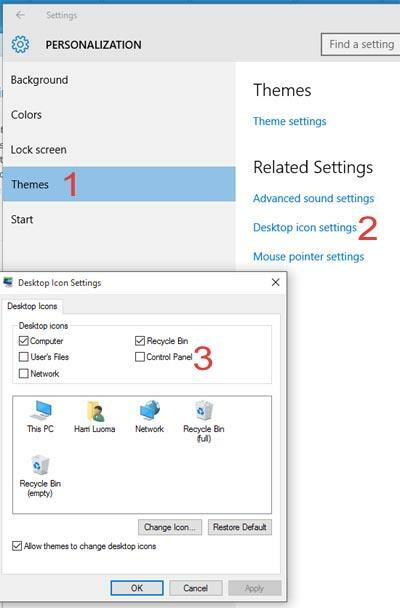 After the Personalization window has opened, first click "Themes" (1) then "Desktop icon settings" (2) and new box opens where you can tick the items you would like to appear on your desktop. After you are done, remember to click Apply. Now you should have an icon to the good-old control panel right on your desktop. Feel free to re-arrange the icons on your desktop.